Home > Real Estate - Surveys > A review of Indian Residential Real Estate in 2016..! A review of Indian Residential Real Estate in 2016..! 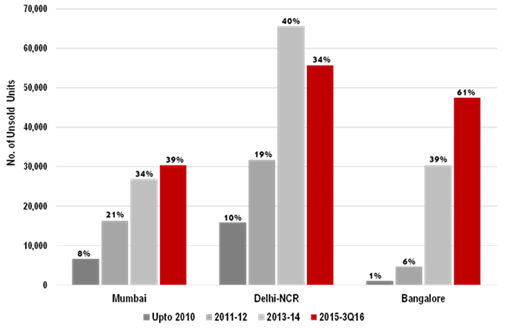 A Pan-India trend that emerged in 2016 was that a higher number of units were sold every quarter (1Q16-3Q16) than new project launches in the same period. 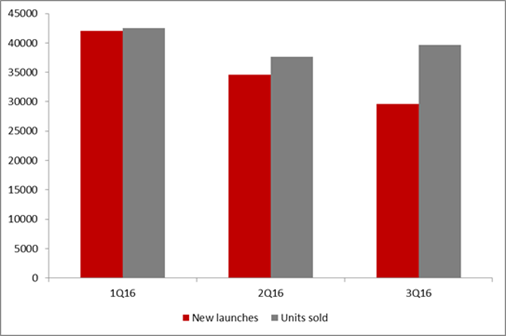 A slowing number of new launches helped reduce the inventory overhang. Demonetization will result in the fourth quarter readings being drastically different from the first three quarters once the come in. Given that old currency notes are no longer valid, home buyers/ investors using unaccounted wealth to carry out transactions in cash are facing a tough time, and developers accepting cash components are facing a higher liquidity crunch than those accepting all payments through cheque / bank transfer. Overall, it will be interesting to see if 2016 sets a new benchmark in units launched versus units sold, surpassing the historic year of 2008 for good. Capital Values (CVs) across cities, especially in Hyderabad, Pune and Bengaluru, saw gentle appreciation in 2016 and this trend is expected to continue in 2017 as the residential markets mature and become more end-user-driven than ever before. Sales’ momentum continued to remain steady throughout the year. It is likely to pick up from 2H2017 after the dust has settled on demonetization, which has made many buyers hold on to their purchase decisions in anticipation of some easing in residential CVs. 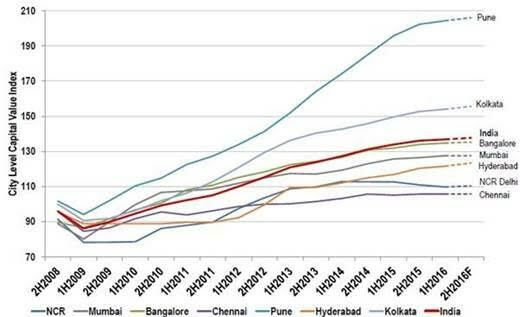 Even as the inventory overhang reduces, the three biggest markets in terms of volumes of unsold units (including under-construction) are NCR, Mumbai and Bangalore. By volume, NCR stands 37%, which is more than a third of India’s unsold (including under-construction) residential inventory. Less than 5% units among the total unsold inventory across the three metros are ready for possession. Bengaluru, a largely end-user-driven market, has the lowest unsold inventory in project launches up to the year 2010. It is selling almost all units by completion of construction. In Mumbai, the percentage is higher, but if we discount the longer timelines it takes for large projects to complete, it would fall under 5%. There are many large projects, high-rises, slum rehabilitation and other redevelopment projects that take a longer time to get completed, prolonging the overall project timelines in the city. Delhi-NCR is burdened with oversupply and dead stock of delayed and stalled projects. The Modi government’s focus on affordable housing has helped in making the term more acceptable to developers. From the previous fear of being tagged as developers who build affordable homes, the community is now not only entering this segment with confidence but also talking about it openly. There is now considerable goodwill attached to such a move, and affordable housing obviously makes eminent business sense. There has been an overwhelming historic deficit of affordable housing projects. Moreover, in the face of slowing sales in the luxury and premium categories, affordable housing can open up a new revenue source for those entering this segment. Across India, more and more developers are entering this important segment to tap into a huge latent demand. Mahindra Lifespace, Tata Housing, Shapoorji Pallonji Group, Assetz Property Group, Puravankara Projects, Maple Group, VBHC Value Homes, etc., are either entering this segment or expanding their affordable housing portfolios. Some more like Emgee Group plan to enter this segment and invest INR 1,600 crore over the next five years. Apart from developers, private equity players are also partnering with developers active in this space to fund such projects. Nisus Finance Services, Brick Eagle Capital, Avenue Venture Partners Real Estate, Carlyle, Essel Finance Advisors & Managers LLP, Provident Housing and International Finance Corp are some PE firms helping developers with their affordable housing projects across the country.